Quick overview Reverend Lee doesn't realise that his dyslexia is affecting his sermons. His parishioners are at first amused and then shocked by the garbled messages coming from the pulpit. Finally a cure is found. The Vicar must walk backwards for the rest of his life. By the author of "The Witches". The Reverend Lee is suffering from a rare and acutely embarrassing condition: Back-to-Front Dyslexia. It affects only his speech, and he doesn't realize he's doing it, but the parishioners of Nibbleswicke are shocked and confused by his seemingly outrageous comments. At last a cure is found and the mild-mannered vicar can resume normal service. Or at least as normal as is possible for a man who must walk backwards to be sure of talking forwards! 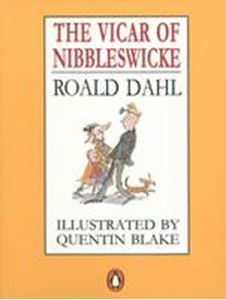 A highly comic tale in the best Dahl tradition of craziness, written for the benefit of the Dyslexia Institute.